It has been a year since we have been displaced. I used the term displaced loosely. I have friends in Guatemala who have no place to lay their heads or accumulate belongings. They are displaced in the real sense of the word. But, here in Texas among my circle of friends, selling a spacious home without a plan in place to permanently lay one’s head and moving into a travel trailer is called displaced. We should be moving into a more permanent structure and out of the RV in the near future. By near future, I mean 126.75 hours. But, who is counting. I’ve only been living in a 232 square foot box with a husband and two men-sized sons for 8765.808 hours. Again, who’s counting. As much as I am looking forward to an expanse of leg room, I am going to miss the constraint. I know it sounds like I have lost touch with reality in the process of losing real estate. However, it is during the times of personal discomfort that God presses out the superficial impurities of my soul. A vitality dwelling deep within awaiting its summons to bubble forth with tenacity and fortitude. Yet, the God-kind of endurance is much different than the sort taught at self-help classes. Sure, God provides the perseverance and courage that not only competes with, but champions, the world’s method of resolution. When tapping into His provision of endurance, God adds a refreshing and unique benefit nothing in this world can offer. Understand, folks, that enduring with God is not a gritting of the teeth while managing a weighty hassle until light appears at the end of your tunnel. Instead, God-infiltrated endurance is walking with the Light in HIS joy. There is no hassle. There is no burden. 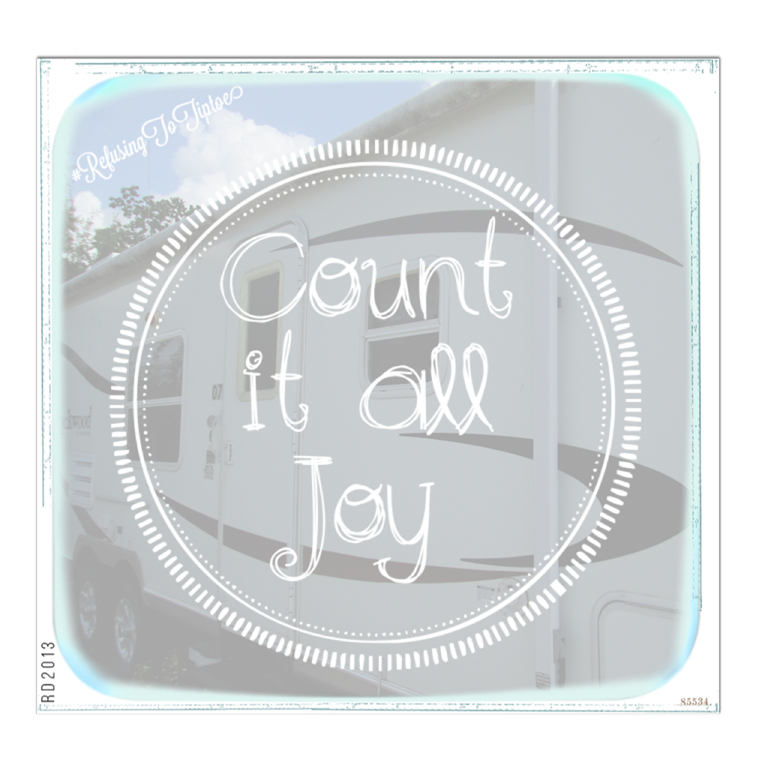 There is joy acquired by resting in the sovereignty of my Lord, knowing I am spending time in an RV because it is a pit stop my Father planned. And, He wouldn’t have planned it if He didn’t have a purpose. May there be continual constraint in my life. For it has been through thousands of hours in a cramped condition that God, through His grace, enlarged my territory of joy. This entry was posted in Thanks Living and tagged Christianity, Endurance, Eucharisteo, Faith, Grace, Lord, Religion and Spirituality, Thanksgiving. Bookmark the permalink. You are an inspiration to me, Cristal. May the Lord continually lavish you with his grace in believing. Wow, Peter, YOU are an inspiration to ME. Of all the people I know, I can think of none other who has experienced the journey of endurance in uninvited circumstances. Thank you for the generous comment; and my God continue to support and carry you by His grace. What a great testimony. God bless you. This is the second time today these verses have been shared with me. At an hour when my body is weary and my Spirit willing it was exceptional to again be reminded. God is indeed ever faithful. Your comments are always an encouragement to me. And (now that I have internet again! ), I am eager to find the expected refreshment from visiting your blog again!